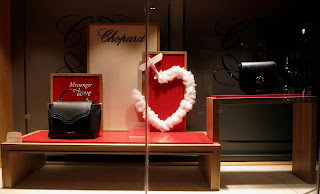 Through pure serendipity we came across this scheme at Chopard on our way from LV to Lanvin (we didnt actually know that this store existed here). We know of the brand of course, although what we weren't aware of is that it is a Swiss watchmakers and jewellery brand dating back to 1860. 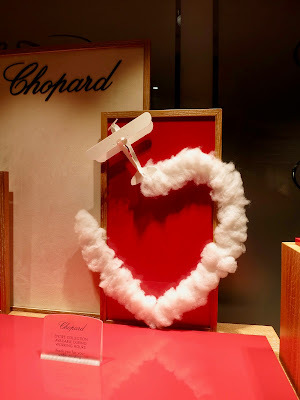 With their nod to the seasonal event a small biplane and obligatory artificial clouds form a heart shape in this otherwise quite austere window installation.